The group followed up the album in 1969 with the self-titled The Band, which reached No. 9 on the U.S. charts, earned them Gold status and eventually sold over one million copies. Such Robertson-penned songs as “Up On Cripple Creek,” “The Night They Drove Old Dixie Down” and “Rag Mamma Rag” made the album and subsequent tour — their first on their own — a massive hit and made the Band a musical and cultural phenomenon. They played the Woodstock festival that year and became the first North American band to appear on the cover of Time magazine. Before disbanding in 1976, the Band released several other critically acclaimed LPs, including Stage Fright (1970), Cahoots (1971), Moondog Matinee (1973) and Northern Lights – Southern Cross (1975). In 1973, they played alongside the Grateful Dead and the Allman Brothers Band in front of 600,000 fans near Watkins Glen, New York. They also continued recording with Bob Dylan as his backup band on 1974’s Planet Waves and on The Basement Tapes (1975), which had been widely circulated on bootlegs before its official release. The group’s farewell concert on November 25, 1976, featured all-star appearances by Dylan, Ringo Starr, Neil Young, Joni Mitchell, Eric Clapton and others. It was filmed by Martin Scorsese and released in theatres as The Last Waltz, often cited as one of the greatest concert films ever made. Various members of the Band reunited in the 1990s to record three albums, ending with 1998’s Jubilation, recorded at the home studio of drummer and singer Levon Helm. He and other band members released successful solo albums in the intervening years. The Band’s homespun blend of country music and rock ’n’ roll continues to inspire musicians decades later, cited by acts such as Blue Rodeo, Wilco and others as a major influence. The group received a Grammy Lifetime Achievement Award in 2008. Disband in 1976, recording the farewell concert film The Last Waltz. 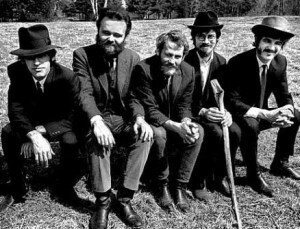 The group formed in Toronto as the backup band for Ronnie Hawkins. The Band were named one of Rolling Stone magazine’s 100 greatest artists of all time.